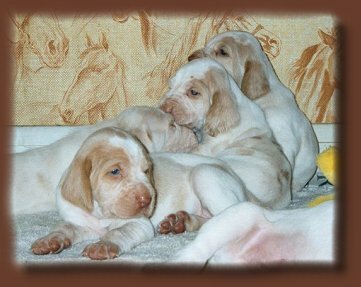 Here are four pups from the breeding of Immacolata Segugio di Morghengo and Gringo di Morghengo. This litter whelped on January 15, 2002. Imma is Mia's full sister, one year older. The 2nd pup from the top is my Bricco. If you are looking for your first Spinone or are researching the breed, you might like to check out my list of reasons NOT to own a Spinone and other puppy related information. 1) Why are you breeding your female? The breeder should be able to tell you the good points and bad points of their female. This means they understand the breed standard and understand their dogs conformation. Although NO dog is perfect, the reasons should be about wanting to help improve the breed. If you don't find that in their response, their reasons could be financial, because they have such a sweet dog, or they want another Spinone, none of which are reasons to breed. Spending a little time in discussion with your potential breeder should help you determine if they are breeding for the right reasons and if they will be a lifelong support for you and your new dog. 2) Why have you selected this particular stud dog to cross with your female? The breeder should be able to tell you why this male was selected to cross with their female. The response should consider conformation, hunting ability, temperament, and how this dog can improve on the female. Remember: Not only are you buying a dog with which you hope to form a long lasting and positive bond but you also should expect the same from the breeder. A breeder should be there for support, encouragement, information, counsel, etc. Is this the kind of person on whom I can depend to be there for me and with whom I can build such a relationship?